Petronas Twin Towers, Malaysia's tallest buildings. 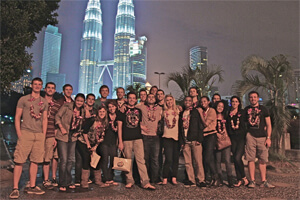 A contingent of more than 30 Blue Devils staff and members have embarked on a journey to Southeast Asia this week, traveling to Kuala Lumpur, Malaysia to present the organization's "System Blue" educational series to an international audience. The group will be featured clinicians at the WBC International Band Camp during a three-day event hosted by the Malaysia World Band Competition and Zi Productions. Working with both students and teachers in Malaysia, the Blue Devils will lead master classes, technique sessions and large-group classes for brass, woodwinds, percussion and color guard from December 15-17. "Bringing System Blue Educational Series to Asia compliments the Blue Devils' strong commitment to the continuing education of its members through both national and international travel," the organization posted in a press release about the trip. "This commitment affords Blue Devils members an opportunity to experience a variety of diverse cultures, traditions, customs and contemporary lifestyles of the world community, through performances and personal interaction." After departing on Dec. 12 from Los Angeles, the group is scheduled to return to the States on Monday, Dec. 19. This is the first international trip for the Blue Devils organization since 2007 when a small group of members traveled to Japan for the 20th Annual Marching in Okayama Festival. The corps is keeping a comprehensive account of its Malaysia trip online with photos, video, blog entries, social media and more. Visit BlueDevils.org to follow the corps and to learn more.